Baltimore and Washington, D.C. -- In the world of traditional music the phrase the “ pure drop” is used in reverential terms to describe music played with great heart and soul, unfettered by any need to make it more “commercially” palatable. It is played for the pleasure of it with both great simplicity and skill. Seeking a taste of it this past weekend, I made a sortie southward down Route 95 to Baltimore and Washington, D.C. for a couple of opportunities to do so and was not disappointed. 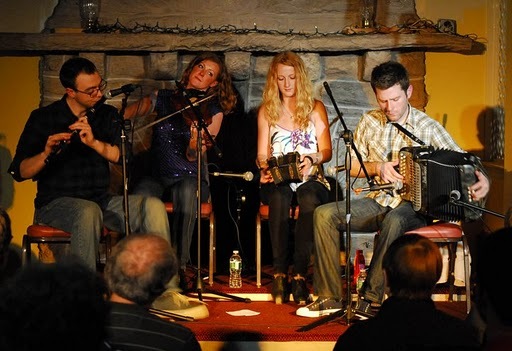 The first stop was in Baltimore where the transoceanic quartet NicGaviskey were opening their brief Easter tour a year after completing their recording there for their self-titled first CD launched in the Catskills last summer, and later at Fleadh Cheoil na hEireann in Cavan. Baltimore would loom large as one of the wells from which their pure drop tunes would flow as it was the birthplace of NicGaviskey’s fine young accordion player, Sean Vincent McComiskey, the son of Billy and Annie McComiskey. So into town came the Meath sisters -- fiddler Bernadette came from her Limerick home while concertinist Caitlin nic Gabhann came from Australia where she was touring with Riverdance, linking up also with Detroit’s Sean Vincent Gavin. The venue was the Creative Alliance at the Patterson Theatre in the Canton district of town, and a lively crowd of family, friends and fans of the young band who represent the past and the future of Irish music without making a distinction, so steeped is it in their approach to the music. They know their sources from the cradle from their lineage and have spent their lives sopping it up and interpreting with their own talent and daring do. Taking the stage with great energy and excitement for the first time in months seemed to recreate the sparks that first lit the flame for the foursome back in 2009 in East Durham at an early morning session. The audience took all they had to give and returned great applause and enthusiasm all night, helping NicGaviskey get off on the right foot for their “reunion” tour. Another aspect of the pure drop music is in sharing it in communal fashion, so a marvelous session ensued at a nearby neighborhood tavern called McGovern’s where an upstairs room seemed purpose built for a roaring session. Locals like Brendan Bell, Billy McComiskey and youngest son Mikey, Laura Byrne, Austin Smith (a good young piper) and Matt Mulqueen joined forces with NicGaviskey. This coming weekend NicGaviskey heads to the Midwest where flute player Sean Gavin’s roots lie, and a homecoming reception in Detroit’s Gaelic League Hall on Friday evening. Sean’s fiddle playing father, Mick from Clare will join the craic. The tour will end in Chief O’Neill’s Pub on Chicago’s North Side for the weekly Sunday session and concert with the city’s best musicians. Who knows what the future portends for NicGaviskey due to its trans-Atlantic makeup of four artists who have jobs and lives that only allow for brief forays like this. But the symbolism and spark that infuses their musical get-togethers is unmatched and forever linked to a serendipitous session as dark turned into dawn on a Catskills morn. On Saturday morning I headed towards tony Georgetown and one of the oldest galleries in Washington, D.C. remaining at the same address. Over 35 years ago, Chris Murray, a Georgetown graduate, opened the Govinda Gallery at 1227 34th Street to show off the work of two friends at that time, and since then it has become one of the premier galleries to exhibit art works with a musical theme, be it Elvis or the Beatles. Traditional Irish Musicians, Singers and Dancers” with 44 pencil drawings artfully drawn by Murray’s wife Carlotta Hester -- an art teacher at D.C. Meret School -- during last summer’s Fleadh Cheoil na hEireann in Cavan Town. Murray’s ancestral roots are in Co. Cavan in Stradone, and he and Carlotta were married there in 2006. Over subsequent summers they enjoyed the Wednesday night sessions at the Farnham Arms Hotel led by Cavan’s musical maestro, Martin Donohoe. Hester, a multi-talented painter and sculptor, also liked to sketch musicians at play while listening to them. One such effort on a paper bag of the charismatic bearded Cavanman captured his imagination and the couple from D.C. for greater possibilities. Were they game to take on the multifaceted Fleadh Cheoil in 2010 in Cavan? The answer was a resounding yes, so they were given press credentials to allow close access to the musicians in the multifaceted marathon that is Fleadh Cheoil na hEireann. Using a rented farmhouse in Redhills as home base, Hester launched into the daunting task of trying to capture the non-stop nature of the flowing tide of music during the Cavan festival. With journalistic penetration she caught the essence of the musicians in midstream teaching, performing or competing in big and small venues and seemingly everywhere in between throughout the Breifne town. She created over 100 drawings in all, depicting many of the fleadh regulars like Antoin MacGabhann and Mick O’Connor, who launched a CD filled with tunes they play together at their annual fleadh liaisons. Also captured where MacGabann’s daughters Bernadette and Caitlin alone and with their group NicGaviskey. Tutors Paddy Ryan, Oisin MacDiarmada, Danny O’Mahony, Micheal O’Raghallaigh, the venerable lilter Seamus Fay and singer Joe Ward as well as numerous other musicians were worthy musical models. With great simplicity and imagination, Hester and Murray have given the fleadh world and its denizens an artistic bualadh bos (applause) recognizing their world class talents through the sketches that freezed their subjects in moments of high creativity. Add to the fact that these fleadh events came together as an enormous display of volunteerism, commitment and community in Cavan last summer, and once again an artist like Hester reveals the very best about the people around us who do great things every day. Cavan may be 3,300 miles away from Georgetown, but a visit to the Govinda Gallery will shorten the distance and draw you closer to the many artists and people who make an Irish fleadh a happening like no other. The exhibit goes through May 28 and may go on the road in the future. Visit www.govindagallery.com or phone 202-333-1180 for more information. SUMMER comes early in the form of the 10th annual Irish Dance Festival this Sunday, May 1 from 1 p.m. to 8 p.m. hosted by the Irish Arts Center. It is a free festival taking place on the Hudson River at Pier 1 in Riverside Park South (enter via 72nd Street and Riverside Drive), part of a series of free events as part of the New York City Parks Department “Summer on the Hudson” series. As in years past this is a showcase for some of the city’s stepdancing schools like the Golden School of Irish Dance, Darrah Carr of Dance, Niall O’Leary School of Dance, Keltic Dreams with Caroline Duggan and the Peter Smith School of Irish Dance from New Jersey. They will offer lessons and performances. A special attraction this year are Riverdancers Jason Oremus, Garrett Coleman and Chris Naish, who will provide a sneak peak preview of Hammerstep, their new dance show that fuses Irish step with tap and hip-hop, according to the press release. There will also be music and song sessions plus a conversational Irish language area, and there will be a two hour ceili at the end of the festival from 6-8 p.m. There will be food and drink available from vendors and in the event of rain, all activities will be moved to covered basketball courts nearby. Full schedule is available at www.irishartscenter.org/dance . . .
Darrah Carr, the artistic director of Darrah Carr Dance, has a master class from noon to 2:30 p.m. providing more in-depth instruction of her ModERIN stylistic interpretations often on display at the Irish Arts Center. You would need to register in advance for that through Rachael Gilkey at 212-757-3318, ext. 209 or via Rachael@irishartscenter.org who can also field queries on the festival on May 1 . . .
ONE of the young ladies vying for the Rose of Tralee nomination from New York, Erin Loughran from Pearl River, was recently elected as youth officer for CCE North America. She is teaching music after receiving her bachelor of arts degree in Irish traditional music and dance last August. She is teaching tin whistle, flute, fiddle and banjo on the Jersey Shore in Middletown and in West Orange (Shillelagh Club on Wednesdays). For more information you can contact her at phone 845-536-8390 or at erin.loughran@yahoo.com . . . FINALLY, piper Paddy Keenan of Bothy Band Fame is coming to lower Connecticut making an appearance at Sacred Heart University’s Schine Auditorium in the Ryan Matura Library (5151 Park Ave, Fairfield) on Friday, May 6 at 8 p.m. For more info visit www.shamrockirishmusic.org.